Continuing the 1970's legacy, the folks at Bennett have brought their iconic brand back to the market with the updated Vector ™ truck line. Sand-cast in the USA and built with the tall style cushions, Bennett trucks will turn on a dime and make surfing streets and carving banks a blast. Excellent choice for a turny ride -- a favorite for Slalom and LDP set ups. Please specify choice of finish and size when ordering. Ships stock with clear red Bennett urethane bushings (90a). Baseplate features both old school and new school mounting patterns. Note bushing upgrades available below and our modified "Skennett" version in related items below. Price listed is for one truck -- all Bennett Truks are sold individually. CUSTOM BUSHINGS: Proper bushing choice and truck adjustment can make a world of difference in your riding experience. Let us choose a specific bushing combo to suit your weight and intended discipline. Highly recommended upgrade option. Choose from Standard (selections from Khiro and Tracker bushings) or Premium (combos from Reflex, Venom and Riptide bushings). Please provide the rider's weight and intended discipline in the notes section when choosing this upgrade option. ABOUT BENNETT TRUKS: In 1975 Mr. Bennett made skateboard history with the introduction of the very first trucks made specifically for a skateboard. 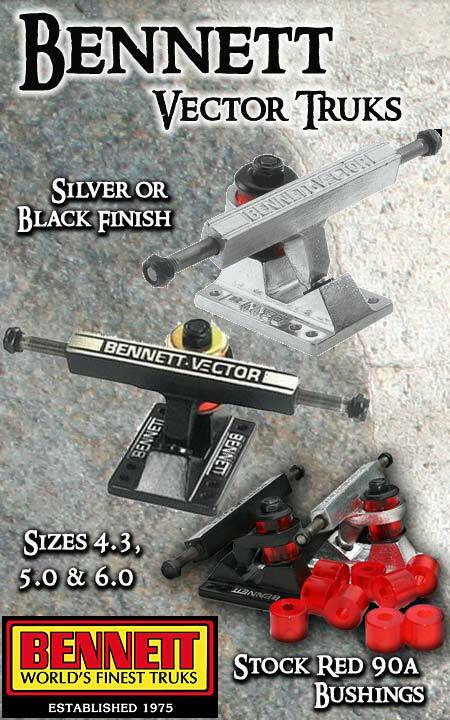 Known for their Big Red Rubbers ™, precision components and amazing turning ability, Bennett Truks ™ quickly became the choice of most professional and amateur skateboarders. Over the years many have copied Bennett's legendary designs and features, but none have ever been able to duplicate the feel or performance. Bennett is family-owned and based in Southern California. All Bennett and Alligator products are proudly made in U.S.A.